There’s plenty of delicious food and drink around at Christmas and it can be just as tempting for our pets as it is for us. However, no matter how much your pet might want to share your human Christmas treats, it is important that you resist. You might think that you are making your pet happy, but you could actually be doing them more harm than good. The odd piece of plain turkey meat won’t hurt your pet, but there are some foods that really could make them unwell. 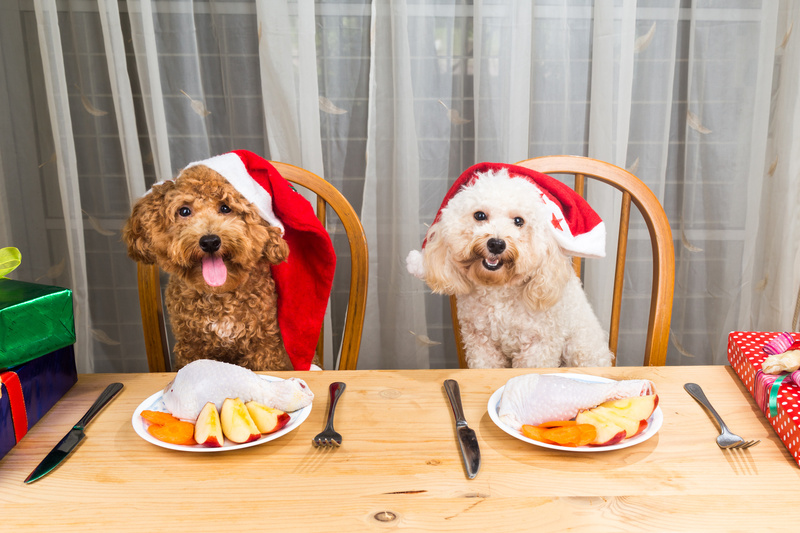 Here are the foods your pet should avoid this Christmas. Whether your pet wants a taste of the grapes on your after-dinner cheeseboard, or to snack on the raisins in your fruit and nut mix, you should not give in. Grapes and raisins contain a toxin that can damage your cat or dog’s kidneys. Don’t forget that raisins are also a key ingredient in Christmas pudding, fruit cake and mince pies, so keep these away from your pet, too. Aside from the fact that nuts can be a serious choking hazard for your pet (even if they chew them, the shells can get stuck in their throat), some nuts contain toxins that can be dangerous, especially to dogs. Macadamia nuts contain a toxin that can affect the functioning of your dog’s digestive, muscle and nervous systems, resulting in weakness, breathlessness and swollen legs. Alcohol should be kept well out of reach of your pets as its effects can be much stronger on them than humans. Even a small amount could cause your pet to become disorientated, find breathing difficult and, in the worst cases, death. You may think that giving your pet the chance to eat the scraps of meat off the turkey bones is the perfect Christmas treat. However, this can actually be very dangerous as turkey bones are hollow, which means they break easily. Not only does this mean your pet might choke, a splintered bone might cut your pet’s insides. It’s a well-known fact that chocolate is poisonous to dogs, yet few people are aware that it can be even more dangerous for cats, who can tolerate an even smaller amount than their canine counterparts. If you really do want to give your pet some chocolate this Christmas, buy them their own specially formulated cat or dog chocolate. It is important to consider that, even if you don’t actively give these foods to your pet, they may be able to get to them in other ways. Be sure to clear plates and cups away and out of their reach (even when you have finished eating and drinking) and put wrappers and boxes into a bin out of their reach. Even the smallest trace of some of these festive food products can make your pet unwell. Buying your pet their own Christmas treats can be a good way to distract them from wanting your own food. If you suspect that your pet has accidentally eaten any of these products, over the Christmas period or at any other point in the year, you should not hesitate to seek advice from your vet. Onions are also bad for dogs, very toxic. One of our border collies managed to eat the remains of christmas dinner last year, and ate the turkey carcass and onions etc. Splintered bones made a mess of his insides, complicated by the other crap he’d found to eat. After the vet bill was settled it was our most expensive meal of all time! Luckily our collie was fine in the end, but it was very touch and go at times. We learned a lesson, however I know he’d do it again if he had the chance! Thanks for sharing that comment, I hope everything is better now. Garlic can also be dangerous for dogs. I have nearly made this mistake when wanting to spruce up the dried food with gravy which has been heavily laced with garlic! If you have turkey bones with scraps of meat left on them, just put them in the slow-cooker overnight, with just enough water to cover. In the morning, the meat can easily be pulled off the bones; and when blitzed up with the stock (use a hand-blender), makes a thick, tasty, nutritious gravy for dogs’ breakfasts.